Recover books from a local ruin and uncover the secrets of its author. Speak to Valaste in the local Mages Guild. She will request that you recover four ancient tomes from a local dungeon. If you are in Auridon, the dungeon will be Ondil. If you are in Glenumbra, the dungeon will be Silumm. If you are in Stonefalls, the dungeon will be Inner Sea Armature. One of the four tomes you will discover is Summoning Rituals of the Arch-Mage, which will appear blank. When you take it, the ghost of Arch-Mage Shalidor will appear telling you to return the book to Valaste in the Mages Guild and that "fire will show her the words." Once you have collected all four books, return to Valaste and give them to her. 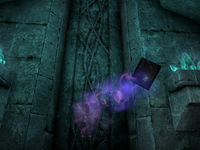 After telling her about the apparition and the blank book, Valaste will explain that mages in the First Era used a special ink that would only be revealed by arcane fire. She instructs you to place the book in an arcane brazier with such a flame burning. Placing the book in the fire reveals complex spells, including an attunement spell that allows one to summon Arch-Mage Shalidor himself. She will instruct you to use several ritual orbs that the Mages Guild has in order to focus your Magicka and draw him to the place. This will also link your mind with his, allowing him to speak with you whenever he chooses. 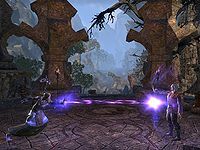 When Shalidor is summoned, he will tell you that your strength of spirit drew him to you in the ruins and that you are to complete his final task: to provide a sanctuary for the Mages Guild. The sanctuary was created ages ago, but was transported to the Shivering Isles after he lost a bet with Sheogorath. To return it to Mundus, you will need to recover four tomes from Cheesemonger's Hollow. Shalidor will open a portal to it and instruct you to go in. Upon arriving, Haskill will welcome you, in a fashion. "Oh how quaint. A mortal." You're free to explore the room at this point, but the only item of note is a book, Cheeses of Tamriel. The only thing left is to speak to Haskill. "Well, what is it? Here for some noble purpose, no doubt." Telling him you're here for the Arch-Mage Shalidor on the hunt for lore books will cause him to scoff. "Spellbooks? How pedestrian. As it happens, I'm feeling particularly charitable at present. I'll allow you to enter. After." After what you ask? "After a test of your resolve. This isn't a lending library. If you want the spellbooks, you'll have to earn them. A portal has been opened, just behind you. Close it, and I'll grant you passage." Haskill then casually opens a portal, which spews Scamps and Dark Seducers. "Close the portal, if you can. Though you may want to deal with those scamps first." Once you defeat them all the portal will close, and Haskill will comment. "Interesting. Well, I suppose." Approaching him again gets you some backhanded compliments. "That was unexpectedly competent. You'd make an adequate house servant. I don't suppose you'd consider it? The pay is meager, but the fringe benefits are appalling." Once you tell him no he continues, granting your request: "Pity. The tomes you seek are beyond the door at the top of the stair. Once you're outside, follow the path." He then gives you a warning: "Just doing the Master's will. I will open the door for you. Oh, and mind the scamps. The little imps adore fresh flesh. Such children," and leads you up the stairs with a couple comments seemingly more to himself: "Right this way." "And please, try not to make a mess of things." "Happy adventuring." Speak to him once more before going through the door. "I'm so glad we've had this time together. One must usually go to a public execution for conversation of this caliber." He will then tell you where you are, "Oh, just one of the many shrines to my lord. The common rabble know it as Cheesemonger's Hollow. Sheogorath is fond of it, but rarely graces it with his presence," who he is, "I am Lord Sheogorath's chamberlain. I handle his affairs and look after the Shivering Isles while his lordship is away," and about the Shivering Isles, "Are you lost? Do you know nothing of the place you've come to? The Shivering Isles are Lord Sheogorath's realm in Oblivion. To tell you more would, as my lord puts it, spoil all the fun." You are then free to pass through the door to a new area that is half a barren wasteland and half a lovely scenic area. At the end of the path is a library that the clannfear Gutsripper is guarding. Defeat Gutsripper and take any of the tomes. Suddenly, the other three tomes will vanish and Sheogorath will appear and demand to know what you are doing. Tell him that you are here to recover the four tomes for Shalidor and he will inform you that he won't give back Shalidor's island without a challenge. He will allow you to take the book you already have, but for his own amusement, he won't give back the other three books until you complete certain tasks. Your only hope of getting the books is to agree and once you do, he'll summon Shalidor to inform him of the deal you've just made. In their conversation, you'll learn that Sheogorath has cursed the books so that Shalidor can never read them. Shalidor will try and attack Sheogorath, but it won't affect Sheogorath and he'll grow bored and leave. Shalidor will tell you to return the book to Valaste so that she can translate it. Unfortunately since he has to open and maintain the portal, he won't be able to join you. Valaste will happily take the first tome, but it will take some time for her to translate it. She promises to inform you once she's made progress, and suggests that in the meantime, you continue to search for lost Lorebooks. The next quest will become available once you have collected enough Lorebooks to reach Mages Guild Rank 2. The book you recover is How the Kwama Lost His Shoes, the first in the Trial of Eyevea collection.